Alberto Rigoni is an Italian bass player and composer who rapidly gained audience in the international music scene thanks to his modern and fresh sound, far away from any well known music cliché. His solo albums (Something Different, Rebirth, Three Wise Monkeys, Overloaded, BASSORAMA, worldwide released between 2008 and 2014), between progressive rock metal and fusion, also feature legendary musicians such as Kevin Moore (ex Dream Theater), Gavin Harrison (Porcupine Tree, King Crimson), Göran Edman (ex Yngwie Malmsteen), Michael Manring and many others. Alberto has been featured on the cover of magazines such as Bass Magazine Japan, Bass Musician Magazine and Bajos Y Bajistas. Moreover, On March 2015 the prestigious Bass Guitar Magazine (UK) released Alberto’s CD anthology called “Into THE BASS”. 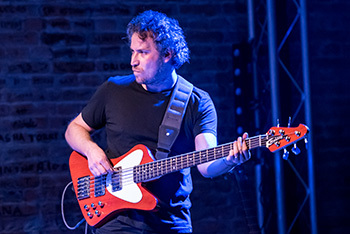 Alberto has also recorded for several international artists such as Italian pop singer Alexia and is now playing bass for Canadian rock singer and songwriter Kim Bingham (Nelly Furtado), The Italians, BADASS, sharing stages with artists such as Alan Parsons, Russell Allen, Jørn Lande, Paul Gilbert and others. Rigoni seventh solo album "EvoRevolution" feat. Marco Minnemann will be released on June 8 2018. After the release of six albums between 2008 and 2017, Italian bassist and composer Alberto Rigoni (soloist, co-producer of Vivaldi Metal Project, founder of Bassists Alliance Project, ex Twinspirits) is now going to release "EvoRevolution", an instrumental prog/rock/ambient concept album which features worldwide known drummer Marco Minnemann (The Artistocrats, Paul Gilbert). "EvoRevolution" consists in a 33mins "concept" suite divided in 6 chapters and in second track called Back to Life.. Are you ready to face a new musical journey?